Although even some of the ducks didn't want to get out of bed! We had a very soggy weekend here in NYC. Saturday, it rained steadily for the entire day. TQ and I had hoped to paddle but we scratched that in favor of lazy day inside. Sunday it was windy and a bit raw with showers now and then - definitely another bad paddling day, but I felt like at least getting outside for a bit, so in keeping with the duck theme I seem to have going here, I decided to go to Prospect Park for a walk around the lake, see if I could find any neat new ducks for Project Duckydoodle. This guy was new to me, but turned out not to be all that neat, at least by birder standards. Interesting looking but not a native duck. He's a Khaki Campbell, a domestic variety of duck noted for egg-laying -- I suspect somebody let him go when they figured out this duck was not going to be the source of many omelets. I think the female is a mallard (Khaki Campbell is crossbreed that includes mallards so close enough). This pair was hanging out just north of the Boathouse. I somehow figured out the variety without help but I'd originally asked my birder friend Mary what kind he was and she mentioned that escaped or released domestic ducks are very common near the Boathouse. I continued to follow the trail that borders the Lullwater. This small flock of Ring-necked Ducks was the next interesting set of ducks I found; I'd actually seen some before the Khaki Campbells but they were pretty far away, too far for good pictures. I sat down on a tree root to watch this group for a while. This was actually one of the kinds of ducks I'd hoped to see, one of my Facebook friends had had some nice pictures of them not too long ago and in fact that may have been what put the idea that I hadn't been for a walk in Prospect Park in an awfully long time into my head. Very attractive little ducks. It's hard to see in these pictures, although there's a hint on the 2nd drake in the 1st picture, but the drakes have a nice purple sheen to their heads. They're called ring-decked ducks because the drakes also have this very subtle chestnut-colored ring around their necks- if you click on the picture above for the bigger version, I think you can see it. They didn't seem to mind me or the very excited fisherfolk on the other side of the water, they seemed to be going about their business quite calmly - but suddenly they all broke into a run and flew away. A moment later a pair of swans came cruising into the area that the ringnecks had just vacated - wonder if that was what spooked them so thoroughly? Slightly less dignified - must be some tasty pondweed down on the bottom, one of the swans moved on through but this one stuck around dabbling for quite a while. In fact I moved on before he (or she) did. Out of the Lullwater now and following the north shore of Prospect Park Lake. I paused again for a while to watch this flock of coots. Now walking along the western edge of the lake. Here's a nice pair of black ducks. Lots of pairing off, or reaffirming previous pairings, going on right now as birds are moving back to their nesting grounds. These two were doing a little spinning dance. Shovelers are marked a bit like mallards, only a little more white, but there's no mistaking them once you get a good look at that big shovel of a bill - that's what they're named for, after all. Uh oh, looks like I've been coot in the rain. And a ducky day in the park draws to a drizzly close. I mostly see these guys when I make it out into the open waters of the Lower Harbor in the wintertime, they seem to like a lot of room. They're very handsome ducks and they have this lovely rising tri-toned call. I haven't ever gotten a photo of one of these but I found a lovely set on the Greg Schneider Photography website, hopefully Mr. Schneider won't mind. 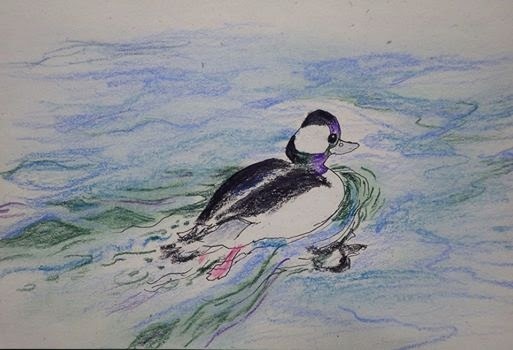 It's been a thoroughly crappy weekend for paddling but I've charged up my camera and I'm going to head out for walk around the lakes and ponds of Prospect Park, see if I see any interesting ducks to draw next week (work will continue to have anxiety-dream-inducing levels of stress and I think coming home and doing a little drawing helps with the unwinding a bit). I had to ask her what he was because I didn't recognize him. 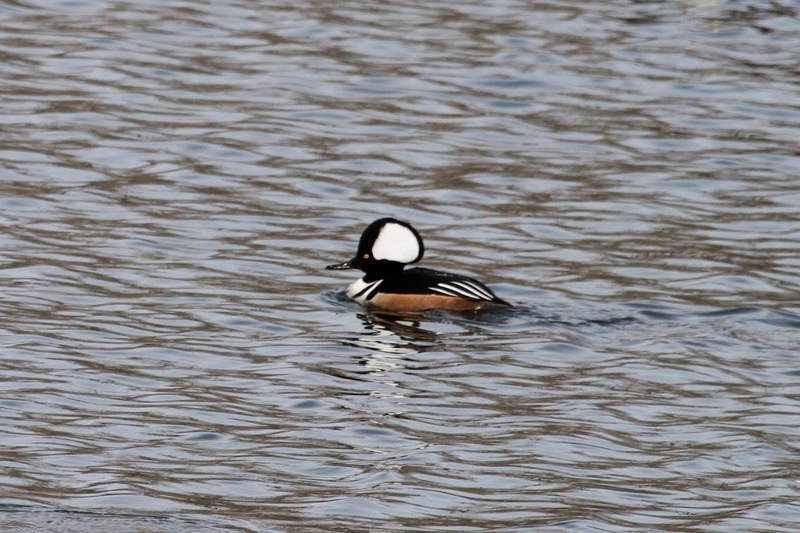 He turned out to be a hooded merganser, which is funny because we'd seen and identified a pair of these when Steve the Paddling Chef got us all out for a hike at the Jamaica Bay Wildlife Refuge - but it's not courting season in January so the mister wasn't trying to impress anyone, so it's not that surprising I didn't recognize this one. Yup, another duck doodle. I'm in the time at work that I call "my own personal March Madness", no basketball involved, just a whole stack of deadlines at the office, late nights, no fun*. In the interest of trying to get myself out of the come-home-and-veg thing that I've settled into rather badly during this cold and nasty winter, I dug out a nice little sketchpad I've had around for a while (it's a Dallas company, so probably a gift from one of the Texas clan at some point). The idea is just to come home and draw a little, nothing particularly elaborate, just giving the brain a little creative break after a long day of number crunching. 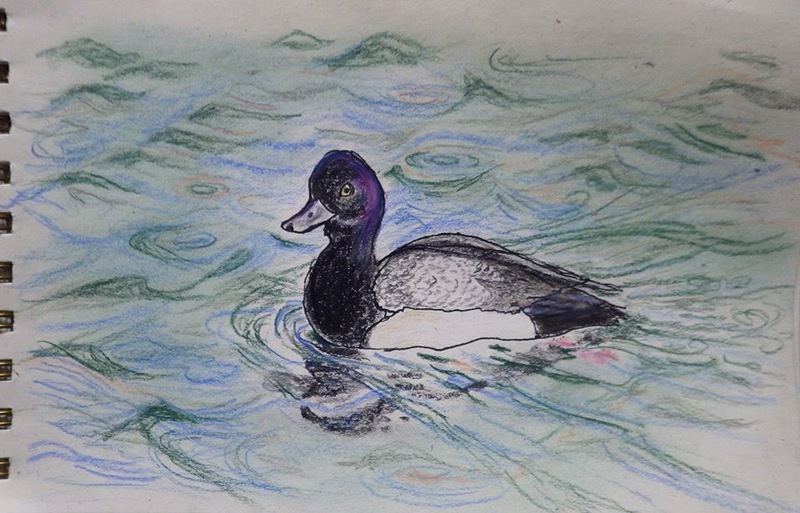 I have all these nice duck pictures from that Sheepshead Bay duck walk I did back in February, this scaup and the bufflehead in the last post are from then. Last year I was doing a lot of post-work walking, which was better from the fitness point of view, but it's just been too nasty for that to be any fun this year. Assuming Spring finally gets its rear in gear after this (hopefully) one last wintry storm that's coming through tonight, I should start doing that again, I was able to do that 18 mile paddle at the beginning of March OK but the last couple of miles I was definitely feeling what a lazy winter I have allowed myself to have! * - No fun? Well, maybe a little. Like, there is this thing I am going to tomorrow night with Patrick Stewart and Ian McKellan. woohoo! PS - Spring IS here and it WILL warm up. 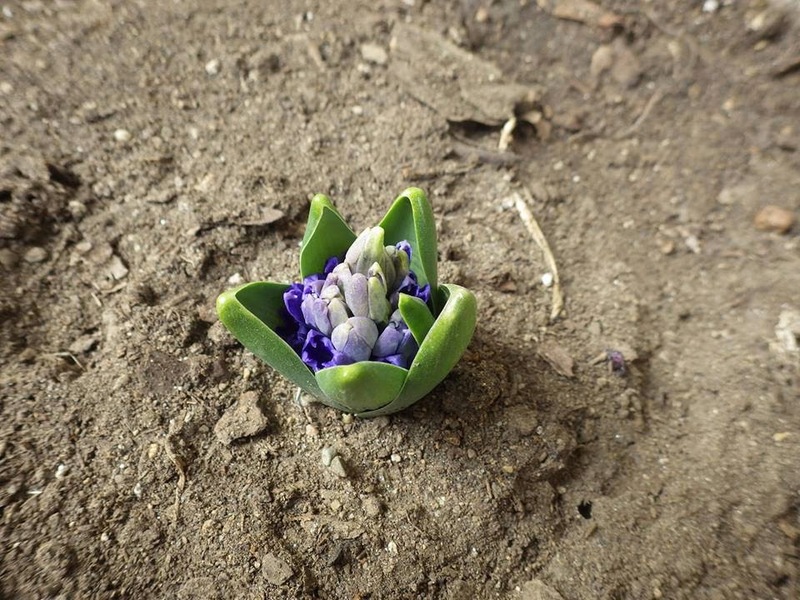 Incipient Hyacinth said so. You know how sometimes you get home from a long day of squinting at spreadsheets and you just really need to kick off your shoes and draw a duck? 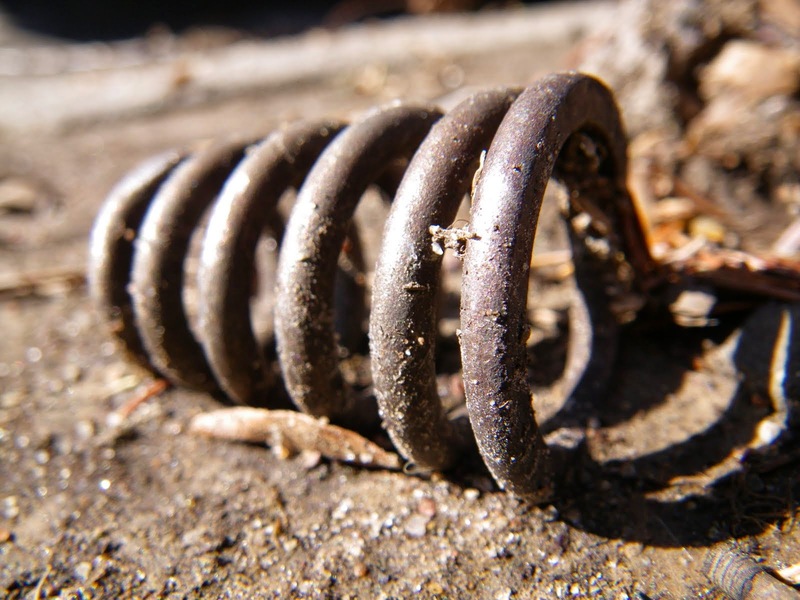 Hooray for Spring! Huzzah! Huzzah! Dear Winter 2013-14 - here's your hat, what's your hurry? Don't let the door hit you on the way out. Sheesh. Seal-Watching Sans Kayak, Hoffman and Swinburne Islands, 3/16/2014, a set on Flickr. Possibly the easiest Sebago trip I've ever planned. "Hey guys, here's the event, here's the website, buy yourself a ticket if you want to come, see you on the boat". Ended up being a great day - I'm so glad that the Bowsprite took Tugster Will on an Audobon tour for his birthday, I'm not sure I would have thought of this on my own. Click here for Tugster's post - brrr, there was still snow then! The tours were only supposed to run through the 9th, but they extended for 3 weeks. I got a ticket the first one when I found out (I'd tried to get on the one on the 9th but it had been sold out, so I was tickled to find out about the extension), and then decided to spread the word at Sebago as this seemed like a great off-season activity that anyone could enjoy. We ended up having a very nice turnout, 8 of us went, and aside from the fun of having friends along, I think this was probably much nicer than the sold-out one on the 9th. With the short notice, I think the Sebago crew made up half of the passengers - no sardines at the railing trying to get the best view, there was plenty of room for all! Sound like fun? There are 2 more left, tickets on sale here.